This pattern is available from craftyalien.com for $6.00. Our amigurumi-style felted knitting pattern is easy for beginners and knits fast for more experience knitters. 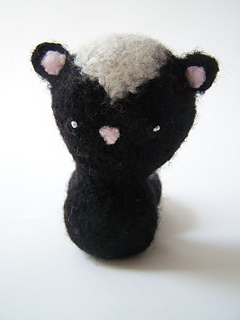 Pattern includes detailed hand-felting and shaping instructions along with diagrams for assembling your animals. Each knitted critter will be approximately 3-1/2” to 4” tall depending on the yarn used and the amount of felting. Stitches include: knit; purl; m1, k2tog, p2tog; basic embroidery. 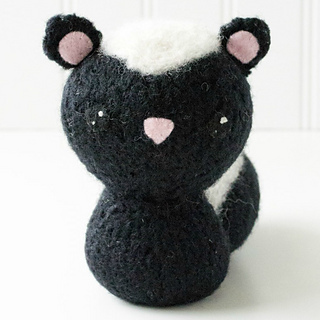 Pattern download includes Skunk, Chipmunk, and Bear. Also available as a single-animal kit.